Okra is in season May to October. Okra contains potassium, Vitamin B, Vitamin C, folic acid and calcium. It also has a high dietary fiber content. 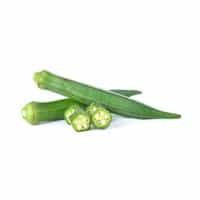 Studies suggest that okra can help manage blood sugar levels. Look for okra with smaller pods around the size of your pinky or index finger and a bright green color with no blackened age spots. Store okra in a paper bag or wrapped in paper towels in the crisper drawer of your refrigerator. Do not wash until you’re ready to consume. Reduce sliminess in okra by soaking in vinegar for half an hour before cooking. Trim the stem end of okra, then prepare according to recipe. Okra is commonly referred to as Lady’s Fingers. Okra was discovered around Ethiopia during the 12th century B.C.